“I am so proud and excited to endorse Cindy Goldberg as candidate for the Conejo Valley Unified School District (CVUSD) Board of Education. If you have not yet heard of Cindy, you soon will as she is a pillar in this community, and well known by many. Cindy has spent the past 15 years in the Conejo working on behalf of kids and schools. She has had a tremendous positive impact on our community in her role as Executive Director of the Conejo Schools Foundation. 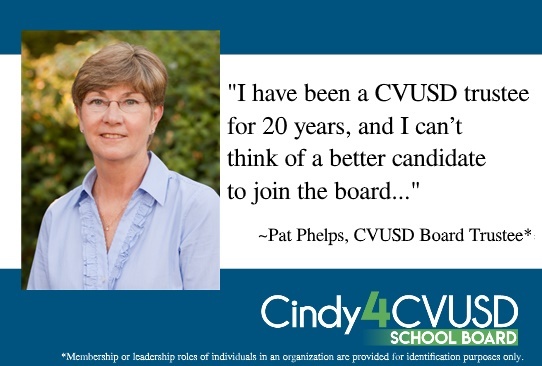 In addition to her paid job, Cindy has been a Super volunteer within the CVUSD. Cindy currently serves as the chairperson of the District Advisory Council (DAC). The primary purpose of DAC, a committee of the school board, is parent involvement. I have attended many DAC meetings as an observer, and I am continually impressed by Cindy’s calm, professional leadership. She has helped to organize, facilitate, and lead excellent, and engaging meetings. Parents share ideas and best practices among themselves and bring them back to their school sites. Insights are then shared with the school board through monthly reports.